Intergalactic secret agent, Lemmy Caution (Eddie Constantine), is sent from ‘the lands outside’ to Alphaville -- a futuristic city where love has been outlawed and the population are strictly controlled. His mission is to investigate the disappearance of fellow agent Henri Dickson (Akin Tamiroff) and to capture or kill Professor Von Braun (Howard Vernon), the man responsible for creating the Alpha 60 super-computer which rules Alphaville through cold logic. Soon after his arrival, Lemmy finds Dickson, who he discovers has become a deadbeat drunk in a seedy hotel, obsessed with escapist pleasure. Enlisting the help of Von Braun’s daughter, Natacha (Anna Karina), as his guide, Lemmy sets out on a nightmarish journey through the bizarre city of Alphaville in his quest to find the professor and destroy the world he has created in the name of free thought and genuine human emotion. In Alphaville, Jean-Luc Godard blends the Sci-Fi and Film Noir genres, and, at the same time, deconstructs and reconstructs them, to create an original and unsettling cinematic vision. Although set in the future on another planet, there are no special effects or elaborate sets; instead, the film was shot in real locations in Paris, the night-time streets of the capital standing in for the streets of Alphaville. Taking as his theme the superiority of love and poetry over inhuman logic, Godard embellishes his unusually (for him) linear narrative with philosophy, technological concepts, wistfully romantic dialogue, and surreally amusing moments where we are reminded that even art films are designed to provoke human emotions. Throughout the film, Godard takes established B movie and genre conventions and puts them to his own use. By casting Eddie Constantine as the trench coat-wearing secret agent Lemmy Caution, a role similar to those he’d already created in dozens of noir films, the director plays on our sense of recognition, only to undermine it with scenes -- such as a fist fight broken down into a series of frozen moments -- where cinematic convention is overturned. 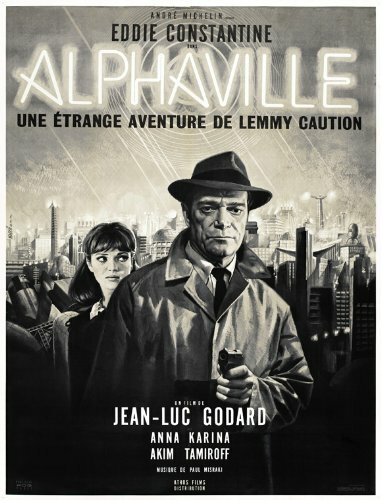 Forty years after its release, Alphaville remains a unique and increasingly prescient work.